The sweet and refreshing aroma of basil essential oil will be familiar to most people, since unlike some oils, it is very similar in aroma to the popular herb it is obtained from. However, there are several types of basil oil available on the aromatherapy market and it is important that you are aware of the differences between them, and why this may matter. The three most commonly available ‘basil’ essential oils are derived from the following species; Sweet Basil (Ocimum basilicum ct. linalool), Exotic Basil (O. basilicum ct. methyl chavicol), and Holy Basil (O. sanctum) which is also known as Tulsi or Tulasi. 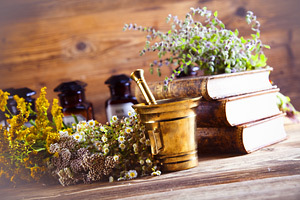 Essential oils from other species are mainly used in the perfumery and flavouring industries and for various reasons are best avoided in aromatherapy. Chemotypes (ct.) are plants of the same genus which appear externally identical, but exhibit a variation in the chemical constituents of their oils due to climatic, altitude or soil conditions. Essential oils of basil should be identified by their chemotype, of which there are many; camphor, eugenol, linalool, methyl chavicol (aka estragole), methyl cinnamate, methyl eugenol and thymol. Back in the 1980’s health concerns were raised regarding a constituent in basil called methyl chavicol which was thought to be a possible carcinogen after force-feeding mice with large quantities of this isolated component. Further research on humans concluded there was virtually no risk at normal dietary levels because humans excrete the carcinogenic metabolites much more efficiently than animals. For perspective, consider the amount of methyl chavicol that would be absorbed by the body after eating pesto sauce which uses basil as the main ingredient! However, in the interests of safety most experts recommend using sweet basil linalool ct. essential oil in aromatherapy since it has only 0.5 to 13% of methyl chavicol, whereas exotic basil oil contains up to 87% of this constituent. This is why it is important to use a responsible supplier who provides all the necessary information (chemotypes etc) on the labels of their essential oils. It also illustrates why it is inadvisable to take essential oils internally unless under the direction of somebody who has been specially trained in this mode of use. Sweet basil is a low growing, tender annual plant, that reaches between 40cm to 80cm in height at maturity. It has square, branching stems, slightly serrated fragrant leaves that are smooth, shiny and paired opposite, with flowers that cluster in terminal spikes. The colour of leaves and flowers varies according to the climatic and soil conditions under which it is grown. 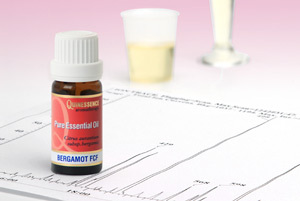 Essential oil cells are located underneath the broad leaves and in the flowering tops. Originally native to India and other tropical regions of Asia as another form, sweet basil has adapted well to growing throughout Europe and the Mediterranean where it thrives under warm, sunny, dry conditions in well drained soil. Sweet basil is grown for the production of oil in several European countries, but the main producers are found in Bulgaria, Egypt, France and the USA. One of the worlds oldest medicinal herbs, basil was used in ancient India to treat colds, coughs and mucous discharges, diarrhoea, dysentery and gastric conditions, headaches, heart disease, inflammation, malaria, poisoning and venomous bites, skin diseases and vomiting. It would be administered as a juice or in teas, infused for massage, or the fresh leaves were applied to wounds. The Roman naturalist, philosopher and writer, Pliny (24-79 AD), considered basil to be an aphrodisiac and good for treating flatulence and fainting fits, whilst the Greek physician Dioscorides prescribed basil for headaches. In France, harvesting of sweet basil takes place throughout July and August as the flowers reach full bloom, and both the flowering tops and upper leaves are collected for processing. Extraction is by steam distillation, yielding a pale straw coloured essential oil with a fresh, sweet, herbaceous and spicy odour. Some experts claim the sweet basil ct. linalool essential oil produced in France has the finest fragrance. With a vast array of healing properties, sweet basil is an outstanding essential oil and in my experience virtually every one of its uses in traditional medicine have proven effective in aromatherapy. It is unsurpassed at bringing clarity and strength of mind to those suffering from stress, fatigue, mental exhaustion and headaches. Basil oil also has a direct action on the digestive system, easing colic, flatulence, indigestion, nausea, and stomach cramps when massaged onto the abdominal area in a clockwise direction. Due to its action on the nervous system, sweet basil essential oil is particularly effective when treating digestive disorders caused by stress and nervous tension. Sweet basil essential oil is a top note that adds a fresh lift to any blend, and works particularly well with bergamot, clary sage, frankincense, geranium, lavender, orange sweet, palmarosa, peppermint, pine and rosemary. Although there is still divided opinion on the subject it is better to avoid the use of any type of basil essential oil during pregnancy. There are over 60 species of annuals, non-woody perennials and shrubs known collectively as ‘basil’. In addition, there are almost 100 cultivars and their various sub-species which display a vast range of physical and chemical variations (chemotypes), often causing confusion to all concerned! 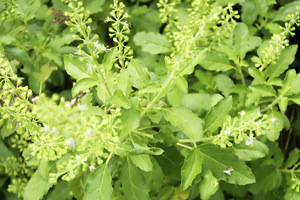 Above: Holy basil plant (Ocimum sanctum), which is also known as Tulsi. Culpepper used basil for venomous bites, and wasp stings believing it 'draws the poison to it'. 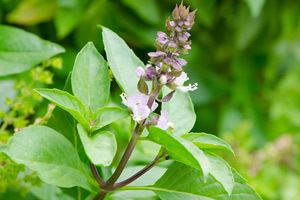 In the Elizabethan period, basil became an ingredient in snuff to help clear the mind and soothe headaches.